On a tabletop with sloping steps, devices must move street-hockey pucks from the bottom step to increasingly sloped scoring zones. 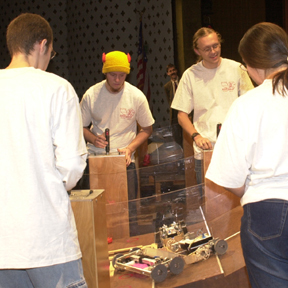 Participants compete in teams of two; each person designs and builds a device. At the start, each team’s devices are positioned within their start zone on opposite sides of the lowest (horizontal) step. Initially, 10 scorable items (SI’s), which are street-hockey pucks, are positioned on the lowest two steps. During the 45 seconds of battery-provided radio-controlled electrical power, each team uses its devices to attempt to move SI’s, to the sloped scoring zones. Each team’s score at the end of each contest is based on the number and location of the SI’s attached within its scoring zones. The score accorded to an SI that is located inside a scoring zone is proportional to the slope of the surface of that zone. In order (from the horizontal start zone to the steepest scoring zone) the values of the scoring zones are: 0, 1, 2, 3, 5, 7, 10, 15. The team with the most number of points on its side of the table at the end of 50 seconds wins. An overall winner will be determined in a double-elimination tournament.